Minneapolis group Cloud Cult headlined Lincoln Hall on Sunday night (6/17) with support from Caroline Smith & The Good Night Sleeps. Were you there? How was the show? 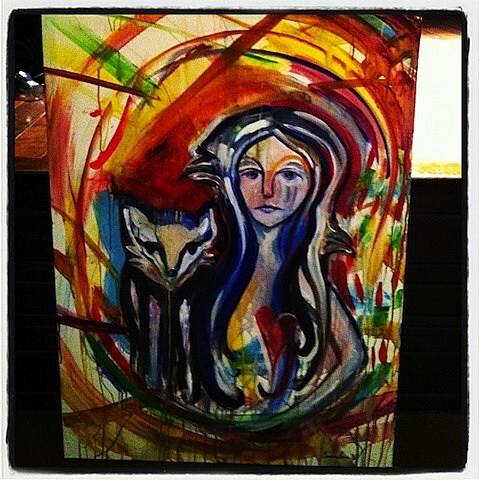 The painting above was created by visual artist Connie Minowa on stage during their set. Check out some video footage of the song “Transistor Radio” at the bottom of this post. As we briefly mentioned, Cloud Cult play the Jay Pritzker Pavilion tonight (6/18) as part of the FREE Downtown Sound series. Judson Claiborne kicks things off at 6:30PM; go find yourself a nice seat on the lawn. Cloud Cult have just a handful of summer tour dates ahead of them, including a performance at the Summer Set Music Festival in Wisconsin in August. All dates are listed below, along with video footage from their Lincoln Hall performance.